Wisconsin's brown marmorated stink bug population is just starting to spread beyond cities. At least as far as the scientific community is concerned, the brown marmorated stink bug first arrived in Wisconsin in 2010. That's when five wound up in Dane County thanks to a car traveling from Massachusetts. Breeding populations were reported in several counties by 2012, and the bug's numbers were increasing by 2015. The bug’s growing presence in Dane County serves as an example of its establishment in the state. In March 2011, an exterminator took out a swarm of the bugs that showed up outside a Hampton Inn on the east side of Madison — the first time they were spotted outdoors in the state. By October 2012, a nymph was found in the county, indicating the presence of a breeding population. By the fall of 2015, the state Department of Agriculture, Trade and Consumer Protection declared the bug had likely become established in Dane County. To date, said Christelle Guédot, an entomologist with University of Wisconsin-Extension and UW-Madison, scientists have confirmed brown marmorated stink bug populations in 11 Wisconsin counties. All are in southern and eastern parts of the state: Dane, Rock, Jefferson, Waukesha, Milwaukee, Racine, Kenosha, Winnebago, Outagamie, Brown and Manitowoc. There also have been unconfirmed sightings in Ozaukee and Polk counties — the latter suggesting the bug has spread to northwestern Wisconsin. 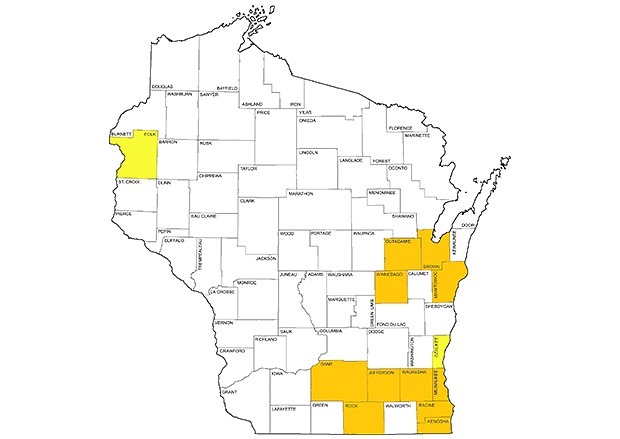 The brown marmorated stink bug has been confirmed in 11 Wisconsin counties and observed in two more. "It doesn't mean that's all we have," said Guédot at the Wisconsin Fresh Fruit and Vegetable Conference in January 2016. "We just don't have reports from other places." One mitigating factor that she noted: While the bug can breed two or three generations per year in warmer states, it will likely manage just one generation per year in Wisconsin. Wisconsin likely will have the same vulnerabilities as other states, said P.J. Liesch, director of the UW Insect Diagnostic Lab. The lack of reported plant damage is mostly a matter of timing — the brown marmorated stink bug hasn't been around the state long enough to build up its numbers to damage crops. "Despite our colder winters compared to places such as the mid-Atlantic states, where the brown marmorated stink bug is a major issue, this insect likely won't be fazed by our winters as it likes to take shelter in buildings," said Liesch. Although the brown marmorated stink bug hasn't yet started to prey on Wisconsin crops, at least as anyone knows of so far, Guédot and Liesch believe the state may be at a turning point. "This spring, we are having [detection] numbers also increasing, we're having detections again around the Madison area, urban areas," Guédot said. Wisconsin's established and growing brown marmorated stink bug population may or may not have reached the point where it spreads beyond cities. Guédot and her colleagues are encountering more of the bugs themselves, in and outside their own homes. "I had almost 10 on my house in the window, trying to get in (this March)," she said. As temperatures drop in the fall, the bugs prefer to enter buildings for shelter, gathering on structures' exteriors to find a way inside. "They don't bite, but they do stink, and they do fly through the house, lodge in AC filters, and congregate in boots and coat pockets and closets," wrote Kate Redmond, a UW-Milwaukee environmental educator. Guédot specializes in fruit pests, and she'll be working with Wisconsin apple growers during the 2016 growing season to monitor for any stink bug incursions. Not unlike the state's confirmed brown marmorated stink bug populations, apple growers tend to be concentrated in the southern part of the state. For now, all entomologists and growers can do is watch. "We're far from having a severe nuisance in agriculture problems, but (the future) is another question," Guédot said.